BANGALORE: A machine used for cardiac surgeries, can cure H1N1 patients. Indian Medical science has brought a ray of hope for the patients affected by H1N1 virus, who are suffering from acute respiratory failure. 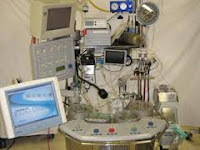 In a unique way, a machine called extra corporeal membrane oxygenator (ECMO) was experimented on an H1N1 patient in Bangalore. After the patient was maintained on ECMO for 15 days, he was out of danger. The 57-year-old V Srinivas, who is a former employee of the Karnataka State Road Transport Corporation (KSRTC), was down with Acute Respiratory Distress Syndrome (ARDS), a grave kind of lung failure, which caused H1N1 infection with symptoms of breathing difficulty & fever. Srinivas had been soon admitted to Narayana Hrudayalaya hospital. Later on he was shifted to the ICU with ventilator support for over 40 days. Afterward, Srinivas was referred for ECMO system treatment. In a miraculous way, he was cured of the disease, said Dr Binoy Chattuparambil, consultant cardiac surgeon, Narayana Hrudayalaya. However, the treatment had been done before on H1N1 patients, it was not proved as effective. According to Dr Binoy, Srinivas is the first patient, who was maintained on ECMO for 15 days & got the positive result. ECMO is a complex machine, which serves as a heart & lung outside the body. With the help this machine the impure blood is taken out of the body & goes through the machine, which purifies the blood. Then oxygenated blood is returned to the patient's body through channels.